“Anita Cerquetti, a gifted Italian soprano who rose to instant fame in 1958 when she was called on to substitute for the mythic and sometimes mystifying Maria Callas in one of opera’s most dramatic episodes, and three years later surprised people again by ending her own career, died 11 October,in Perugia, Italy. She was 83. Her death was confirmed by Alfredo Sorichetti, a conductor who helps oversee an annual singing competition and academy named in Miss Cerquetti’s honor, in her hometown, Montecosaro. She had been hospitalized for several days after a heart attack, he said. The drama that brought Miss Cerquetti worldwide attention began on 2 Jan., 1958, a Thursday, the opening night of Bellini’s NORMA at the Teatro dell’Opera in Rome. After Callas, the glamorous American-born prima donna in the lead role, received a few derogatory whistles amid much applause for the first aria, ‘Casta Diva’, she began to appear tense. She never emerged for the second act, locking herself in her dressing room. Boos, hoots and foot-stomping shook the cheap seats. In the royal box, the president of Italy, Giovanni Gronchi, and his wife waited nearly an hour before leaving, and the show never resumed. Callas retreated to her hotel, insisting she was ill, and stayed there for five days. She could hear chants in the street below: ‘Down with Callas!’. By Saturday, there was a new chorus: ‘Long live Italian women!’. Those were the words that met Miss Cerquetti, a rising star who happened to be performing the same role in Naples, when she stepped in for Callas at the Teatro dell’Opera for the first time on that Saturday night. The audience loved her, roaring at her version of ‘Casta Diva’. Callas apologized for her absences and offered to return to the stage the following week — to sing two performances free. The manager of the opera house declined, and the Italian government, which subsidized the opera house, ordered her replaced. The role now belonged to Miss Cerquetti, who had a powerful, dramatic voice that audiences adored. Miss Cerquetti, who was just 25, had already impressed opera lovers in the United States, making her début with the Chicago Opera in 1955, singing the role of Amelia in Verdi’s UN BALLO IN MASCHERA. But while replacing Callas thrust her to a new level, it also took a toll. She went on to noted performances at La Scala in Milan and elsewhere, and on Italian radio broadcasts, but just three years after those tumultuous days at Teatro dell’Opera, she abruptly retired and all but disappeared. This time, it was Miss Cerquetti who faced questions. Had her voice failed? Did she have neurological issues? Heart problems? She blamed fatigue. ‘It got to the point where I had absolute need of physical rest. Above all, I needed to sleep. This was from stress. But, thank God, my vocal cords remained intact and have remained so until today. This is the truth’. ‘Miss Cerquetti’s recorded performance of arias by Verdi, Bellini, Spontini and Puccini leaves no doubt that her voice is a remarkable instrument’, John Briggs wrote in The New York Times in 1957 in a review of an Operatic Recital by Anita Cerquetti, one of a small number of commercial recordings she made. ‘Whether it is being used with skill is another question’. “While Ettore Bastianini's career was quite short, it was also distinguished. He was regarded as having one of the finest Verdi and verismo voices of his day, though his vocal gifts were not always matched by an equal musicianship. Bastianini studied privately with Gaetano Vanni, and sang in the local choir. His professional solo debut was in a concert in Siena early in 1945, and his operatic debut was at the Ravenna opera as Colline in Puccini's LA BOHEME later that year. He sang at the smaller houses throughout Italy and even went abroad to Cairo with a touring company, still singing the bass repertoire, including Mephistopheles in Gounod's FAUST. His La Scala debut was in 1948 as Tirésias in Stravinsky's OEDIPUS REX. During these years, he began to wonder if he was truly a bass, and in 1951, he made his debut as a baritone early in 1951 at the Bologna Opera as Germont in LA TRAVIATA. However, the performance was not especially successful, and he resumed intense studies over the next few months, giving special attention to developing his upper register. When he returned to the stage that summer, he had achieved just that goal, and his high notes were now considered his vocal glory. In 1953 Bastianini performed opposite Maria Callas for the first of many times, as Enrico Asthon in LUCIA DI LAMMERMOOR at the Teatro Comunale Florence. That same year he sang the role of Carlo Gérard in Giordano's ANDREA CHÉNIER for the first time at the Teatro Regio di Torino. He made his Metropolitan Opera debut as Germont on 5 December, 1953, opposite Licia Albanese as Violetta and Richard Tucker as Alfredo. 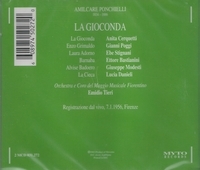 The following January he sang Enrico to Lily Pons' Lucia and Jan Peerce's Edgardo at the Met. On 10 May, 1954, he made his debut as a baritone at La Scala, in the title role of Tchaikovsky's EUGENE ONEGIN with Renata Tebaldi as Tatyana. In the Fall of 1954, Bastianini joined the roster of the Metropolitan Opera where he sang regularly through May 1957. His roles at the Met during this time included Amonasro, Carlo Gérard, Count di Luna, Enrico, Germont, Marcello in LA BOHEME, Rodrigo in Don Carlo, and the title role in RIGOLETTO. He later returned to the Met in the Spring of 1960 to portray several roles including Don Carlo in LA FORZA DEL DESTINO. He returned to the Met again in January 1965 where he spent most of that year singing in several of his prior roles with the company, as well as performing Scarpia in TOSCA. His 87th and final performance at the Met was as Rodrigo on 11 December, 1965. It was also coincidentally the last performance of his career.